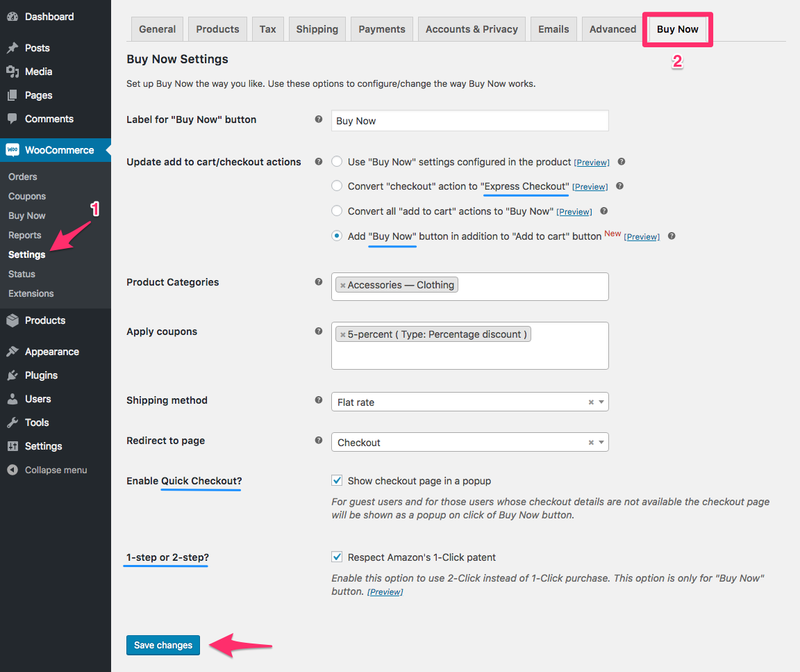 You can find WooCommerce Buy Now storewide settings at WooCommerce -> Settings -> Products -> Buy Now. Label for “Buy Now” button: This label will be shown on all Buy Now buttons on the store. Use “Buy Now” settings configured in the product: If enabled, this will use “Buy Now” settings from the product (if configured in the product), otherwise it’ll be ignored. Convert “checkout” action to “Express Checkout”: If enabled, this will convert all WooCommerce “checkout” action to “Express Checkout”. For example, the default “Proceed to checkout” button will now act as “Express Checkout” and it’ll try to take the customer to final step including payments. If Buy Now will not find any required information in-between, it’ll take you to that information for changing. Convert all “add to cart” actions to “Buy Now”: If enabled, this will convert all “add to cart” button to behave as “Buy Now” link. It means, when this button clicked, it’ll try to take the customer to the final step including payments. Enable Quick Checkout? : When enabled, for all guest users, Buy Now button will open the checkout page in a popup for further processing. 1-step or 2-step: By default, all Buy Now link will behave as 1-click Buy Now. But when this setting is enabled, the same Buy Now process will behave as 2-click Buy Now. Basically, this adds a confirmation page just before payment. Express Checkout button will be visible on Cart page just above Proceed to Checkout button. If a customer’s payment information is available from their previous order and if they click on Express Checkout button from cart page, then customer’s order will be automatically completed thus saving them one step in the checkout process (as they won’t be shown checkout page). “Buy Now” button: When checked, “Buy Now” button will be visible, otherwise it’ll not be visible. When this is enabled, following settings will override storewide settings (if configured). By default, this setting will be disabled. Apply coupons: Optionally, you can search & select a coupon or more. These coupons will be linked with the Buy Now button. On clicking that Buy Now button, these coupons will be applied to cart. This field will be effective only when the “Buy Now” button is enabled. Shipping method: Optionally, you can set a payment method for buy now button of this product. This field will be effective only when the “Buy Now” button is enabled. Redirect to page: Optionally, you can set a page where the “Buy Now” button will take you to after processing the buy now functionality. This field will be effective only when the “Buy Now” button is enabled.